Porsche has announced the expansion of their Porsche Cayenne Platinum Edition to four models and this includes some new paint finishes. The range now includes two Cayenne S Models which include the petrol version and also the Cayenne S Diesel. The high quality of the new Platinum Edition models is demonstrated by their refined yet understated exterior. In addition to the standard exterior colours of black and white, five optional metallic paint finishes are also available: Jet Black, Mahogany, Purpurite, Carrara White and Rhodium Silver. The exterior package includes elegant and sporty touches in high-gloss black, tinted privacy glass at the rear and wheel arch extensions in the vehicle colour. The Platinum Edition stands for sporty functionality. Bi-Xenon main headlights with the Porsche Dynamic Light System (PDLS), Power Steering Plus and front and rear Park-Assist make driving effortless, whether travelling on long-distance journeys or driving around the city. The automatically dimming interior and exterior mirrors prevent glare from the traffic behind. As you enter the vehicle, the “Platinum Edition” lettering is revealed on the front door entry guards of the refined Cayenne S models. 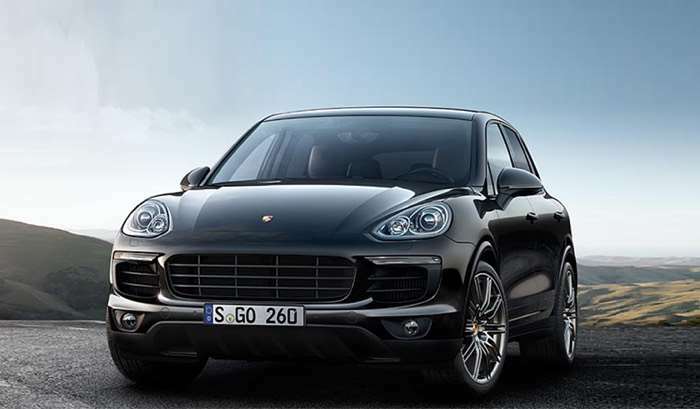 You can find out more information about the new Porsche Cayenne Platinum Edition models over at Porsche at the link below.